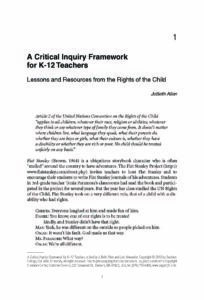 Summary: This sample book chapter explains what teacher-led critical inquiry means in a social justice context. Useful in planning inquiry groups with a social justice focus, it also includes excellent content to help teachers to bring a social justice focus to their individual inquiry practice and encourage their students to take a critical inquiry stance in the classroom. In this chapter, we’ll explain what “critical inquiry” came to mean for us and for our students in terms of critical stance, critical literacy, and critical questioning. We’ll share the influence of critical researchers and educators who focused us on literacy and social class, and the story of how Rebeccah Williams Wall and her students led us to the UN Convention on the Rights of the Child. Finally, in the spirit of examining multiple perspectives, we address some of the controversy surrounding the Rights of the Child.